The long reining segment leader, Honda City got a new design in 2008 and with it came a lofty price tag as well. Not that it was any cheaper earlier according to the times however at this time, it has crossed the limit and has almost ventured into bigger brother Honda Civic’s territory. Not to say given its looks, space quotient, performance, fuel efficiency and the Honda badge , car buying public in India lapped it up. It soon became the best seller that it always was and on top of it, it sometimes outsold some hatch backs which were offered at a fraction of its price. Many tried to emulate the success of the Honda City in the mid size car segment however they all met with moderate success. Stacking the claim to the throne now are two fresh contenders. One with an engine upgrade and the other, an all new car for the Indian market. Time for another showdown and determine the rightful winner for the throne. Throw in the Fiat Linea T-jet Plus, Honda City V manual and the Volkswagen Vento Highline. The variants tested are all the topmost petrol variants since the Honda City still doesn’t have a diesel engine. Fiat Linea T-jet Plus – In comes the Italian beauty from Fiat Motors India Limited. 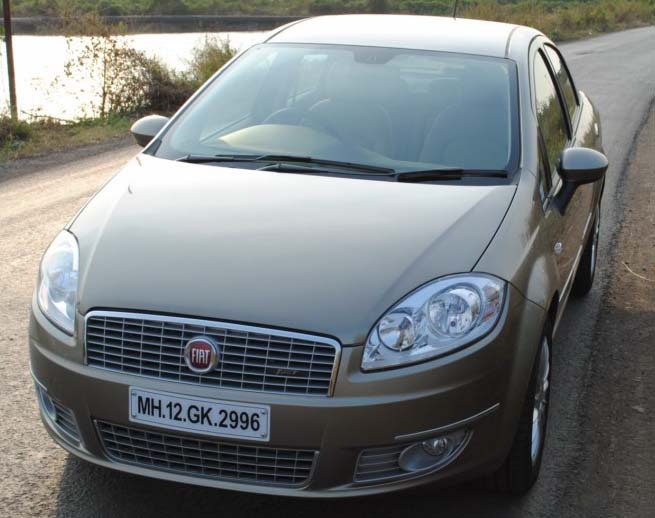 The Fiat Linea, when launched early on in 2009, was quite successful inspite of the company’s lackluster image. The main reasons were its looks, space and VFM quotient. Its Maserati nose looks quite elegant and classy. There are some element from even Aston Martin. Overall, it gives the car a good looking pose. For the new Fiat Linea T-jet Plus model, there are 16 inch multi spoke alloy wheels. The tyres are of the 205/55 R 16. The door handles are also quite distinguished with chrome linings. For the rear tail lamps, there is also a chrome strip inside. Honda City V – The arrow shot design was quite a pleasing car to look at when it was first launched around Diwali in 2008. It still is now. Honda have actually managed to create a car which would age gracefully and still wouldn’t look out of place even after 7 years down the line. It hides the cab-forward design quite aesthetically unlike the previous generation Honda City. Honda have recently added alloy wheels to the Honda City V and those look like they have been actually stolen from the Toyota Corolla. The rear is also quite beautifully shaped. Volkswagen Vento Highline- This is an all new grounds up model from Volkswagen and based on the Volkswagen Polo platform. It retains the same look as the Polo from the front and only a trained eye would be able to tell the difference between the two. The differences though minor are still there to be seen. The placement of the air dam in the Volkswagen Vento Highline is a bit lower than in the hatchback whereas the sedan doesn’t have provision for fog lamps. The boot has been also added with quite a precision and if the hatchback wouldn’t have been launched earlier, then the sedan would have been quite distinct. Round 1, its very hard to pick a winner however if left to me, I would go with the Fiat Linea T-jet Plus. Fiat Linea T-jet Plus – The new model comes with improved plastics and ones better than its diesel powered sibling. The steering wheel is also quite meaty to hold and contoured in feel. It has the Bluetooth as well as audio controls on the steering wheel. The dials are of those classy types with retro feel. The automatic climate control works well. The seats especially the ones for the front passengers are power adjustable. The standard audio sounds okay. The Fiat Linea T-jet Plus is one car which is solidly built and this shows in the way the doors and other lockables close. The plastic quality is still iffy in some places however those surfaces are hidden away from view. At the rear, the headroom is a bit lacking because of the sloping roofline. Rear seat passengers are also pampered with their own individual aircon controls. Honda City V – The Japanese tinny build quality is not so pronounced in the Honda City V. The doors shut with a thunk that is pleasing to the ears. The equipment list is very pathetic considering the price point that this car is been offered at. It lacks a normal CD player and makes do with an AUX and ipod input. There is no climate control on offer and the knobs for the AC also are quite big and chunky like smaller hatch backs. The dash design is very futuristic and features soft touch materials. Some of the plastics like those around the AC knobs and some of the control switches feel out of place because of plastic quality. What the car offers is space in oodles. There is ample space in the front and rear. Not many would be fatigued even after long drives in this car. Volkswagen Vento Highline- There is a sense of German precision the moment you enter the cabin of the Volkswagen Vento Highline. The doors shut with a solid feel and there is a combination of griege in the cabin. This makes the cabin airy than it seems to be. The switchgear also works with precision. The meters are very easy to read and also incorporate a gear shift indicator for optimizing the mileage. The steering wheel is good to hold however lacks audio controls and there is no provision for Aux input as well as Bluetooth pairing. Plastic quality is the best amongst the lot. There is a rear AC control for the rear passengers. A clever feature in the car is a lever at the back of the front passenger seat. This lever can be used to move the front seat ahead. Of these three, the Volkswagen Vento Highline’s cabin seems the best even though it is not as feature rich as the Fiat Linea T-jet Plus. Fiat Linea T-jet Plus – This car is the one which has the best poise amongst all the midsize cars. It is unfazed by the small or big pot holes. However this sense is amplified at high speeds. The steering wheel is one of the best in its segment. The suspension, though on the firmer side is also pliant enough to absorb bumps and at the same time not transmit them onto the passengers. Only at low speeds does one feel bumps a bit. The handling of this car has improved with the onset of the new engine under the hood. The steering is sufficiently light at city speeds and weighs up nicely as the speeds build up. Cornering is effortless on this car. 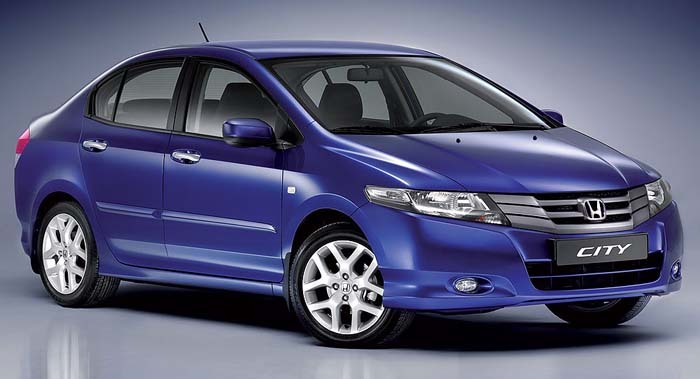 Honda City V – This Honda runs on a firm suspension and one firmer than the Fiat car. This means that while the car moves over pot holes or surface irregularities, it does let the occupants know what is going through. Out in the city, this translates to some discomfort however once on the highway, the car just soaks in all the bumps. On the handling front, the car show an eagerness for directional changes however at the very limit, the car understeers gently. It however runs out of grip quite early and this can be easily put on the 175/65 R15 tyres that it comes shod with. These tyres cannot cope up with the excess power that the engine makes. The steering weighs up sufficiently while at speeds and its finger tip light in the city. Volkswagen Vento Highline – Having the same platform as the Polo does give this car a highway stance that many would desire for. It is very stable on the highway however its ride quality deteriorates. It is softly sprung and hence bigger pot holes on the highway do faze it. Out in the city, it soaks up all the pot holes and never lets the occupants know what is beneath. The steering wheel is quite at home in the city and loses it composure on the freeway. It doesn’t provide enough communication like the others in this test. Its less reluctant to go around corners however once in a corner, it is quite at home. The winner of this round is the Fiat Linea T-jet Plus with its perfect mix of ride and handling properties. Fiat Linea T-jet Plus – The Fiat has reemerged with a turbocharger for its 1.4 liter engine. This bumps up the power to 114 Bhp from the previous 90 Bhp. It puts out 21.1 kgm of torque and this is enough to induce wheel spin in first gear and even on the second gear. This surge of power ends only at the 6,600 rpm red line. The first three gears are closely spaced to aid the city driving dynamics whereas the taller 4th and 5th gear ensure relaxed cruising on the highway. At its top speed of 176 kmph, the car is quite vocal in its operation however the engine loves to be revved and is an enthusiasts delight. The gearbox is precise if a bit notchy. The car reaches 0-100 kmph in 11.1 seconds. Its fuel efficiency is pegged at 10.6 kmpl in the city and about 15.3 kmpl on the highway. Braking is handled by a segment first, all wheel disc brakes along with ABS and EBD. Safety is taken care by active whip lash head restraints, 3 point SRS seat belts for all the 5 occupants and 4 air bags. Honda City V – Now, it is a known fact that Honda makes enviable engines and the 1.5 liter iVTEC motor is no different. It produces 118 bhp and 14.9 kgm of torque. This is enough to propel the car from 0-100 kmph in 10.28 seconds. The engine like the other Honda engines, makes its peak power at higher rpms and the engine just loves to be revved. Its high rpm red line at 7,200 rpm is proof enough of this. The engine doesn’t feel strained even while achieving its tops speed of 180 kmph. The gearbox is also very slick and a delight to operate. The cabin is well insulated from all the noise that the engine makes outside. In the city though, you would be left hunting for the right gear. This is because of the peak power coming in quite late into the party. The best part is inspite of all the thrashing that the car receives, it still returns 10.1 kmpl in the city whereas the on the highway it gives 16.5 kmpl. Braking is achieved via discs at the front and drums at the rear. Assisting them are the standard ABS and EBD components. Safety is taken care by collapsible steering column, 2 air bags and 3 point seat belts. 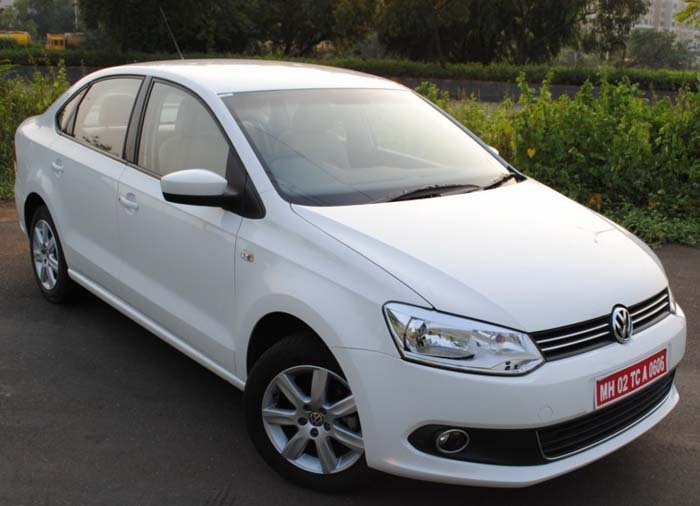 Volkswagen Vento Highline – The Volkswagen Vento Highline has the biggest engine displacement at 1.6 liters however it produces the least power here at 105 Bhp and 15.6 kgm of torque. This shows in the acceleration figures with the car taking 12.8 seconds to move from 0-100 kmph. It attains a top speed of 182 kmph though. The gear boz is one of the slickest units around. It feels like a knife slicing through hot butter. The motor is smooth for most of the part however it becomes quite vocal near its 5,400 red line. It however is the most tractable and easy to live motor in this comparo. This car isn’t that fuel efficient by returning 9.8 kmpl on the city driving whereas it gives 15.6 kmpl on the highway. Braking is handled by disc and drum combination with only ABS as a support. Safety is not that well thought off in the Vento with the car failing to have child locks inside. It however does have 2 airbags and 3 point seat belts for all 5 occupants. This round undoubtedly goes to the Fiat Linea T-jet Plus. This is really a tough one. Going by the looks, all the three cars are aesthetically designed and wouldn’t offend any one. The interiors are also wide and varying with some preferring more features whereas some others plonking for nice look inside the cabin or German solidity. The all important fuel efficiency figures are also closely matched with just a difference of some kilometers in the overall presentation. All three cars have highly reliable engines and a good service back up though the Fiat and the Volkswagen aren’t so strong in this department as compared to Honda. The only differentiating factor may be the price of the car.The Volkswagen Vento Highline costs the least amongst all this cars at Rs.8.23 lakhs, the Fiat Linea T-jet Plus follows it closely at Rs.8.99 lakhs whereas the Honda City V is the costliest at Rs.9.58 lakhs. Since we really have to pick up a winner, it would be the most value for money car out of this lot and it is the Fiat Linea T-jet Plus. It has loads of features, nice interiors, scintillating performance, fuel efficient and at the same time complete value for money proposition. The only thing lacking is a bit of rear head room, some more improvement in the plastics and also attention to servicing. One wouldn’t actually go wrong with any of these cars.